Location: Southern terminus of the Richardson Highway #4, on the north shore of Prince William Sound; 305 highway miles (115 air miles and 383 nautical miles) east of Anchorage; 365 miles south of Fairbanks. Alaska Marine Highway "Fast Ferry" service between Valdez, Cordova and Whittier. Population: 4,500. 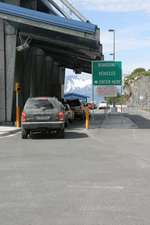 Visitor Information: Valdez Convention & Visitors Bureau Visitor Information Center, 200 Fairbanks Street, P.O. Box 1603, Valdez, AK 99686. 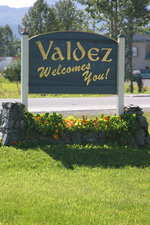 Phone: (907) 835-4636, toll free (800) 770-5954; Email: info@valdezalaska.com. 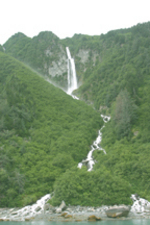 Provides information on Valdez and surrounding areas, local charter excursions and points of interest. Open daily in summer, weekdays in winter. Valdez lies at the head of Valdez Arm, one of many natural fjords, reaching inland twelve miles from Prince William Sound. 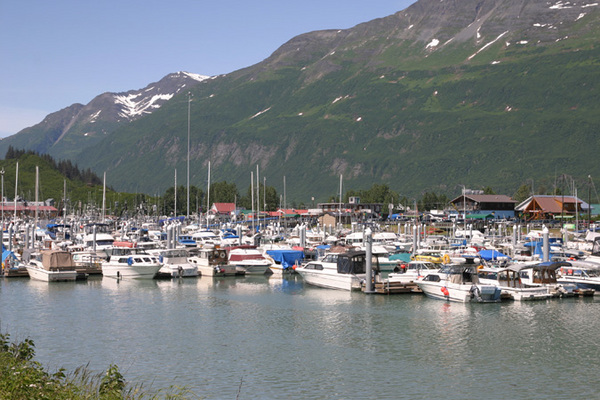 Port Valdez enjoys a temperate climate, is ice-free and open to navigation during all seasons. The region around Valdez and beautiful Prince William Sound offers unparalleled recreational opportunities. Surrounded by majestic mountains and spectacular glaciers, the clear cold waters harbor rich fisheries of five species of salmon, halibut, red snapper, rock bass, ling cod and grey cod, as well as shrimp, crab and clams. Fishing for pink and silver salmon and halibut is top notch and derbies are held for each of these species. 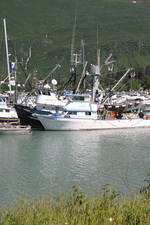 Many charters are available from the Valdez small boat harbor. Hiking, sailing, kayaking, fishing, mountaineering, hunting and wilderness experiences may be enjoyed all summer long. In winter, Valdez boasts some of Alaska’s finest cross-country skiing at Mineral Creek and Thompson Pass, snowmobiling on endless terrain, and Alpine skiing on challenging courses at Thompson Pass and Salmonberry Hill. Keystone Canyon’s many waterfalls offer challenges to all levels of ice climbers and classes may be taken from professional climbers and instructors. A year round pleasant climate enhances the many outdoor activities. This area was under Russian rule from 1778 until 1867 when the territory passed into U.S. hands. 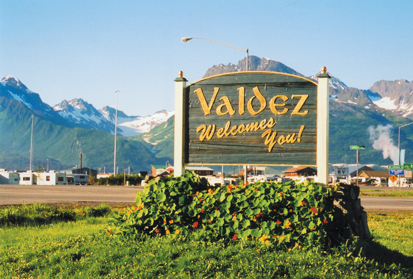 During these years, Valdez was a trading post for natives from the interior who traded skins and dried meat. Although fur trading was the principal activity in Valdez, salmon canning, fox farming and gold and copper mining contributed to its growth and settlement. During the Klondike Gold Rush of 1897–98, more than 3,000 prospectors poured into Valdez, believing the Copper River and Valdez Glacier to be the entry to the interior gold fields. The winter of 1898–99 was especially severe and hundreds of prospectors died from malnutrition and scurvy. A few months later, a detachment of American soldiers found an easier bypass already being used by prospectors, which made crossing the glacier unnecessary. Mining and prospecting flourished in the area. From 1910 to 1916, Valdez had the longest cable aerial tramway in the world for moving copper ore down to cargo ships in the bay. Valdez was the staging area for work on the lower portion of the trans-Alaska Pipeline during the mid 1970s. Valdez has known disaster in proportions that few areas have ever experienced. On Good Friday in 1964, Valdez was struck by the largest earthquake ever recorded on the North American continent. The quake measured 9.2 on the Richter Scale and was followed by a series of waves and waterfront fires; Valdez was virtually destroyed. Geological studies declared the town site unsafe and the new city was relocated to its present site near the mouth of Mineral Creek. In April of 1989, the Exxon Valdez ran aground; its massive hulk was ripped apart and millions of gallons of oil were released into the waters of Prince William Sound. Clean up took well over a year to complete and today the port waters have recovered and wildlife flourishes. The $50 million Port of Valdez container and general purpose marine terminal boasts the largest concrete dock ever constructed for cargo use. Connected by an 1800-foot causeway, this facility is helping the city regain its position, lost to earthquake and tsunami, as the natural gateway to the Interior and Far North. Short trips and overnight tours to the Columbia Glacier are available from Valdez. This impressive fast-moving river of ice covers 440 square miles and is three miles wide at its face and 30 stories high. Constantly calving, the glacier sends towering chunks of ice into the waters of Prince William Sound. Seals and whales cavort between the floes and birds soar everywhere. This is truly a wonder that shouldn’t be missed. Explore the fjords and passageways of Prince William Sound from Valdez with Stan Stephens Glacier and Wildlife Cruises. The dedicated crew invite you to join them as they travel the calm waters of the Sound to Columbia and Meares Glacier. The Valdez Museum and Historical Archive, located in the Centennial Building at the corner of Egan Drive and Chenega Street, features exhibits of pioneer days, old mining equipment, freight sleds, fire fighting apparatus, a glacier exhibit and a pipeline terminal exhibit. 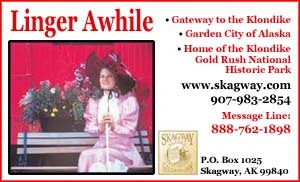 Summer hours are Monday to Saturday, 9 AM to 6 PM and Sunday 8 AM to 5 PM. A small admission is charged. With its roots in the generous donation by Mrs. Maxine Whitney of reportedly the largest private collection of Native Alaskan art and artifacts in the world, the Maxine and Jesse Whitney Museum provides a unique look at Alaska life, cultures and wildlife. Enjoy premier displays of Eskimo kayaks and umiaks, Native carved ivory and trophy-class mounts of Alaska’s big game animals, including grizzly bear, polar bear, moose, caribou and musk ox. Other favorites include Native dolls, beautiful Athabaskan, Eskimo and Tlingit bead-work, Native Alaskan baskets, prehistoric artifacts, fossils, minerals and Woolly Mammoth tusks. Arriving in Alaska in 1947, for more than 50 years the Whitneys lived in and traveled to remote villages of Alaska like Gambell and Savoonga, buying directly from Native artists. Mrs. Whitney assumed ownership of the Eskimo Museum in Fairbanks in 1969 and operated it through the mid-1980s. In 1998, Maxine gifted her vast collection to Prince William Sound Community College. Now in a dedicated facility located adjacent to the college, it is a cherished cultural and educational asset to the community, offering a unique view of Alaska through the eyes of a passionate collector. The Maxine and Jesse Whitney Museum is located at 303 Lowe Street. Open every day May to Sept and most weekdays during the winter. Free admission. Call (907) 834-1690. The Valdez Convention and Civic Center boasts a variety of events such as movies, conventions and cultural performances. Surrounded by the unmatched scenic beauty of alpine and marine landscapes, visitors can choose from comfortable accommodations or something more rustic and remote. There is lodging available in over 500 rooms year–round, ranging from hotels and bed & breakfasts to wilderness cabins and campgrounds. Whatever your selection, you will be treated to true Alaskan hospitality. Hotel, motel and bed & breakfast reservations are advised during July and August. Five full-service RV parks and three campgrounds are available in town. 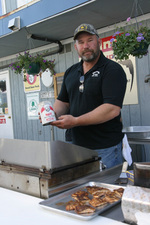 Services in Valdez include several restaurants, grocery stores, service stations, drugstores and gift shops. Fishing! Just the word can make an Alaskan resident or visitor go into a frenzy. The popularity of fishing in America’s largest state can hardly be exaggerated. The first item you will need is a state fishing license, which is required for anyone over 16 years of age. One day, three day and season licenses are available. Most charters in Valdez range from 6-12 hours depending on where you are fishing, what species you are fishing for and whether everyone limits out early, and of course, the weather. Remember the weather may be unpredictable and could force alternate plans. Be sure you ask your charter what is included in the price of your trip. Small boat rentals are available in the small boat harbor, if you want to captain your own boat. Prince William Sound offers astonishing beauty as well as outstanding fishing. King, pink or silver salmon abound in Prince William Sound, while halibut, ling cod, red snapper and black bass are plentiful a few hours away in Alaska’s most productive fishing grounds. Each year Valdez hosts fishing derbies, featuring daily, weekly and grand prizes as well as prizes for the largest halibut, pink and silver salmon of the season. Derby tickets are available through most local merchants and charter boat operators. When traveling to Valdez, don’t miss Keystone Canyon, a place of spectacular waterfalls, magnificent geology and fascinating history. 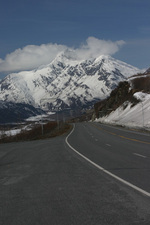 Keystone Canyon is located at miles 14-17 on the Richardson Highway. From 1910 to 1916 copper and gold mining flourished in the area. There were attempts to build a railroad through the canyon and into the copper country. Rival railroad corporations fought a gun battle in the canyon to secure a right-of-way north of Valdez. A tunnel built at that time can still be seen as you drive through the canyon. Keystone Canyon is the place for thrill seekers. Raft or kayak the Lowe River which runs through the canyon. The magnificent, steep-sided rock walls offer popular summer and winter climbing challenges. For those who prefer to keep their feet on the ground, the Valdez Goat Trail is a great place to hike. It is located at mile 13.5 in Keystone Canyon and begins at the Bridal Veil Falls turnout. Don’t forget to take along your camera and capture the flowing waterfalls on film. The best-known falls are Horsetail and Bridal Veil Falls. Located on the Alaskan road system, Valdez offers premiere sea kayaking, hiking and sailing opportunities in Prince William Sound. Multi day trips either by sea kayak, sailboat or motor yacht from Valdez venture deeper into the wilderness of the Sound. Because Valdez is farther from Anchorage than Seward, Whittier or Homer, the area is less crowded, making the east side of Prince William Sound a favorable destination for boaters seeking a more remote wilderness experience. 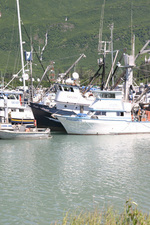 The afternoon breeze in Port Valdez also offers exiting opportunities for small boat sailing. Additionally, many hiking trails are available in the Valdez area. The Shoup Glacier trail was built with Exxon Valdez oil spill restoration funds and follows the coastline for ten miles to the glacier. The old military trail takes you into Keystone Canyon as well as the Mineral Creek trail that ends at an old stamp mill. Anadyr Adventures offers kayak rentals, tours, multi-day adventures and training for novice to experienced sailors and can be contacted for information on at (907) 835-2814 or 1-800-TO-KAYAK. Sea kayaking is one of the more popular activities travelers can participate in to explore Prince William Sound. The Sound is famous for calm water paddling, dozens of active glaciers and an abundance of wildlife including marine mammals & birds. Sea kayaking is a sport that anyone can enjoy. Kayaks are stable and the guides will give basic instruction before the tour. Each kayak is built for two people and can be safely and enjoyably controlled by two paddlers. Best of all, kayaking can be enjoyed in rainy and sunny weather. You’ll probably hear the guide say something like, “What’s better to do on a rainy day than go check out a glacier in a kayak?” With proper clothing, you’ll stay dry and warm. There are several great paddling destinations offered by the local guide service. Some of the most popular destinations are Duck Flats, Shoup Glacier and Columbia Glacier. The Duck Flats tour begins with a paddle right from the Valdez harbor. The two glacier tours are full day adventures in which the guests are transported by motorboat to the protected bays near the glaciers to begin the actual kayaking. Shoup Glacier offers a unique view of a tidewater glacier that actively calves into the water, sending off large waves and thunderous sounds. This might sound dangerous, but with the guide in the lead, you are guaranteed to be a safe distance back. The upper bay of Shoup Glacier is a State Marine Park and is also naturally separated from the main channel of Prince William Sound by a shallow channel, which discourages larger motorized vessels from entering the bay. Kayakers are some of the only visitors to Shoup Glacier. Another attraction at Shoup Glacier is a colony of black-legged kittiwakes nesting on a small island in the upper bay. There are about 20,000 of them to be exact! Columbia Glacier is world famous for being one of Alaska’s largest tidewater glaciers. Although there are no opportunities to watch this glacier calve, the area offers exciting paddling though towering icebergs. The recognizable deep blue of the icebergs is a great subject for photographers. 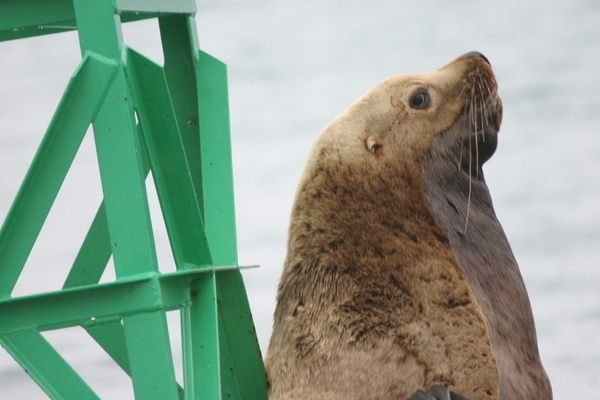 There is also an abundance of wildlife, including seals, sea otters, sea lions, whales and dozens of bird species. The ride out in the motor vessel is also a great way to see the wildlife and scenery. Keystone Raft and Kayak Adventures offers kayaking, whitewater rafting and wilderness floats in Prince William Sound and the Copper River Valley. Keystone can be contacted at 1-800-328-8460 or 907-835-2606. A passion for Alaska camping, glacier and wildlife day tours and longer tours of the Prince William Sound wilderness defines Anadyr Adventures, the original sea kayaking company in Valdez. Join naturalist guides as they expertly lead you by kayak in the shadow of towering mountains, pristine fjords, majestic waterfalls, imposing icebergs and active glaciers. Kayakers may paddle right out of Valdez Harbor or take the Anadyr water taxi to start an Alaska adventure in the heart of Prince William Sound. No experience is necessary, only the ability to paddle 10 to 12 miles each day, an average of 5 hours with frequent stops for wildlife watching, photography, lunch and onshore activities. At the end of the day camp is set, with time to take a hike in the rain forest, beach comb, fish or relax in camp and enjoy the beautiful surroundings, always keeping a watchful eye for wildlife. Prince William Sound has the greatest diversity of wildlife habitat along the entire northern Pacific Coast. Two hundred forty species of birds have been observed and during migration tens of millions of birds traverse the area. Anadyr Adventures will provide a professional guide, all necessary kayaking and safety gear, group camping and cooking equipment, with the choice of supplying your own food or letting the guides prepare delicious meals for you. Anadyr Adventures also offers mothership-supported two-to-fourteen day kayaking tours to remote and spectacular parts of Prince William Sound, spending time in hidden bays and protected passages. You have the choice of staying on board one of Anadyr’s comfortable sailing or motor yachts. The vessel crosses all open waters, allowing you to set your own pace with more time for activities and relaxation. Anadyr provides warm comfortable sleeping quarters, hot showers, delicious meals, all the necessary kayaking and safety equipment, professional guides, licensed captain and a motorized skiff for safety and on shore activities. All you need to bring are your clothes, camera and the willingness to share an unforgettable experience. Trips are designed to accommodate from four to six guests for up to 2 weeks. The itinerary changes according to your particular interests, the number of days on board, the weather conditions and the physical abilities of the kayaking guests. Mothership trips are the ideal choice for novice kayakers, anniversary and honeymoon couples, families with smaller children, groups with diverse interests and for everyone who prefers traveling in the comfort of a small group with a flexible itinerary, personalized service and a warm shower at the end of each day. Nestled in the lush rainforest of Virgin Bay in Ellamar, a turn of the century copper mining town, Prince William Sound Lodge combines fascinating history, gourmet meals and outstanding coastal paddling, day hikes and beach combing. Visit sea otter pupping grounds, observe a spectacular variety of birds and frequent visits by the humpback and orca whales cruising past Ellamar. Anadyr Adventures can be contacted at 1-800-865-2925 (TO KAYAK) or 907-835-2814. Email: anadyr@alaska.net; Website: www.anadyradventures.com. Dock Point Trail is a one-mile loop located on a secluded hill close to downtown Valdez. Parts of the trail are wheelchair accessible. The loop features excellent overlook south-facing views of Port Valdez, easy walking on gravel trails and boardwalks and a more difficult section connecting two timber overlook platforms. Future development plans include restrooms and wildlife interpretive signs. Shoup Glacier Trail: This trail begins at the far south end of town and follows along Port Valdez for approximately six miles, offering beautiful scenery and unbelievable birding opportunities. When completed, the trail will run twelve miles to Shoup Bay. Covering mild terrain, this trail is a wonderful walking/hiking tour for all. Valdez Goat Trail: Situated in Keystone Canyon, this trail offers a magnificent view. The trail begins with a rather steep incline but gradually evens off to an easy hike. View ice climbers and river rafters right from the trail. Approximately five miles long (round trip), this is a wonderful way to explore and experience the magnificent Keystone Canyon. Solomon Gulch Trail: Located on Dayville Road, this trail is an easy way to enjoy a wonderful view of downtown Valdez from across the bay. Walk a piece of the Alaska pipeline and remember to bring containers for berry picking.